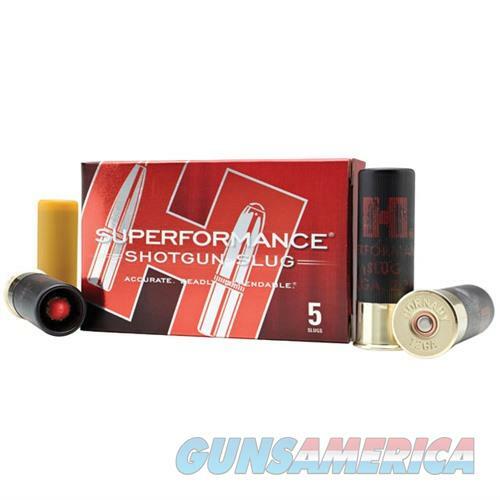 Description: Hornady 86237 SUPERFORMANCE SHOTGUN AMMO 12 GAUGE 2-3/4" 250GR SABOT SLUG Supercharge your rifled barrel slug gun with Hornady? Superformance? Shotgun Slugs! At the heart of the Superformance? Shotgun slug is the MonoFlex? a monolithic solid projectile made from gilding metal (95% copper / 5% zinc) and topped with the Hornady? exclusive Flex Tip? feature that works as a catalyst for uniform expansion, even at the low velocities of longer range impacts. The MonoFlex? won't separate, and retains 95% of its original weight. Specifically engineered to deliver accuracy, penetration and extremely high weight retention, the MonoFlex? is a non-traditional / alternative metal option that is a fantastic choice for ALL hunters. Fueled by the use of our specially blended propellants, the Superformance? Shotgun Slug is built to deliver maximum velocity for flatter trajectories and enhanced terminal performance. The slug's internal sabot and gas seal construction is scientifically engineered to trap gases that deliver uniform pressure and velocity while working to force open the petals and uniformly push the slug toward its target accurately.